Question id: 361. This question is similar to one that appeared in an IB Standard paper in 2018. The use of a calculator is allowed. The diagram, not drawn to scale, shows a quadrilateral ABCD. The worked solutions to these exam-style questions are only available to those who have a Transum Subscription. Subscribers can drag down the panel to reveal the solution line by line. This is a very helpful strategy for the student who does not know how to do the question but given a clue, a peep at the beginnings of a method, they may be able to make progress themselves. This could be a great resource for a teacher using a projector or for a parent helping their child work through the solution to this question. The worked solutions also contain screen shots (where needed) of the step by step calculator procedures. A subscription also opens up the answers to all of the other online exercises, puzzles and lesson starters on Transum Mathematics and provides an ad-free browsing experience. 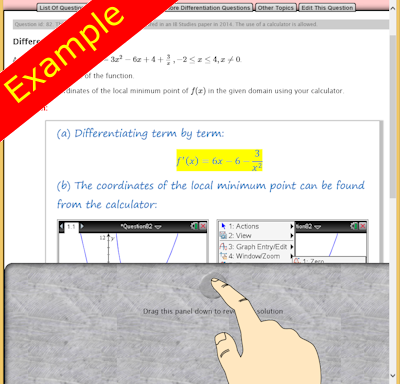 If you need more practice try the self-checking interactive exercises called Advanced Trigonometry. The exam-style questions appearing on this site are based on those set in previous examinations (or sample assessment papers for future examinations) by the major examination boards. The wording, diagrams and figures used in these questions have been changed from the originals so that students can have fresh, relevant problem solving practice even if they have previously worked through the related exam paper. The solutions to the questions on this website are only available to those who have a Transum Subscription. To search the entire Transum website use the search box in the grey area below.